Fashions of London and Paris, June 1801. 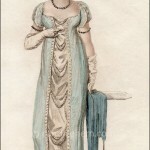 In the first years of the new century, evening full dress often included a hat, as seen here. 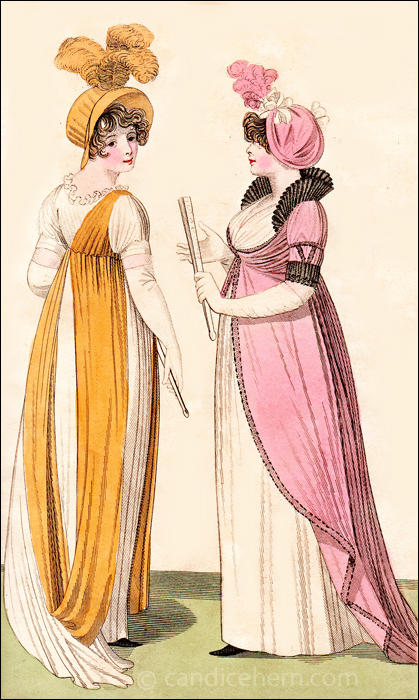 Hats continued to be worn with evening dress throughout the extended Regency period, but are seen much less frequently in prints after c1804, when more attention is given to the hairdo, often ornamented with a fillet or bandeau or flowers. 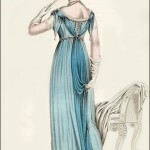 Around 1817, hats are once again popular with evening wear, and are seen in many fashion prints from that time forward. The use of black lace in the dress shown on the right does not necessarily represent mourning. 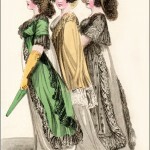 In prints from c1798 – c1805, black is often seen in trimmings, and seems simply to have been a very popular color to embellish a dress. Note also the very large fans. Though folded, they appear to be at least 12″ high, which would be quite large when opened. At about this time, when skirts had narrowed and large pockets had disappeared, much smaller fans were becoming more popular, as seen here. “Fig. 1. The Egyptian dress made of white and buff-coloured muslin. The buff muslin forms a drapery which is fastened on the right shoulder with a clasp. It is also confined in the waist, whence it hangs carelessly almost to the bottom of the dress, and is turned up t the left side, where it terminates. The bosom is trimmed with lace; the sleeves full and short. Buff-coloured hat, with three buff ostrich feathers.